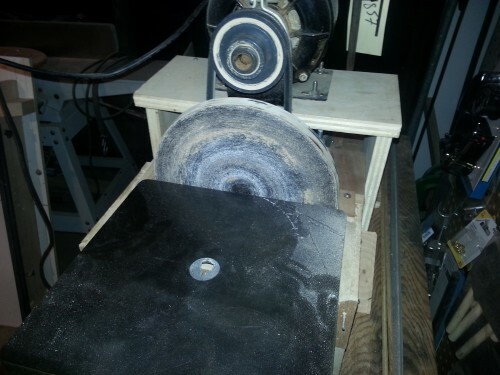 Here is a homemade disc sander that I came up with. I made this out of total necessity of needing one very badly but not having the money to buy one. I had picked up a old scroll saw for twenty bucks that I could never get working. I needed the disc sander and after attempting to make the scroll saw useable for the third time without any luck I decided to repurpose it. 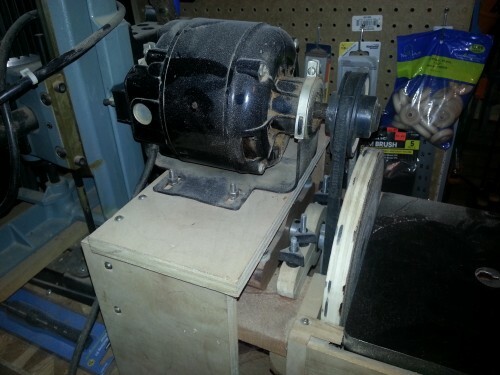 It was a pretty old scroll saw from 1939. I know some may scoff at somebody trashing an old tool but to me if I can’t use it then I have no place for it in my very small shop. So I really needed a sander, as I have said, and got to thinking the motor and the shaft from the scroll saw would work very well for the disc sander. I then proceeded to mangle the saw and grab the parts I needed. I took the motor with the pulley and the shaft out of the inside that made the saw go up and down. ( I don’t know what that is called) I cut the counter weight off and made a clamp out of wood with a bearing to hold the shaft. The disc is attached to the other end. I made the disc from some 3/4 plywood laying about and then made a box to hold the table from the saw and to service as a dust collection area that I could hook the vac up to. With this done I decided to bolt the motor above the disc, as you see in the picture, for two reasons. I know that the best place would be under neath the tabletop that the whole device sits on but I didn’t have that long of a belt and the switch to turn the motor on is on the back of the motor. So I made a platform and stuck the motor where you see it. When I get time I think I will change that. For now it works way better than I anticipated and I am very happy. The motor does get in the way sometimes and I did not make the table adjustable so those things will be in the revised plans. 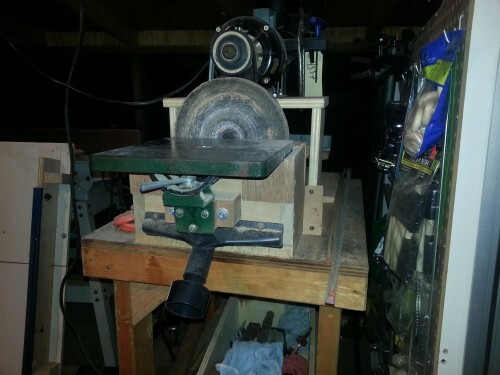 After that my next project will be a belt sander that I will be able to quickly go from 4″ wide to 1″ wide belts. This I will try to incorporate into it’s own station but next to the disc sander. that way I will be able to have the vac ports easily interchange. I really do not like the disc belt sander combo that they sell. I mean they are cheap now and the time I will have invested in this could have warranted buying one but I really think mine will perform better and I can make it to my exact needs. Thanks for checking out my page and follow me on google plus!